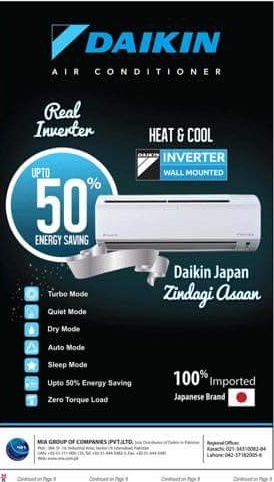 Daikin Japanese company launched its wall mounted air conditioners in Pakistan Daikin Split Air Conditioners are fully featured products available in three different models. Above models have only cooling facilities without inverter technology, Daikin also released their inverter wall mounted air conditioners which works on low voltage and save your electricity bills. Daikin also launched their Floor Standing Air Conditioner two models 2.0-Ton & 4.0 Ton. Both models are sleek, stylish and modern to blend into any environment, it has stylish black control panel with white LED light and other features are Long air flow, Energy saving, powerful cooling and silence, user friendly, air purifier.